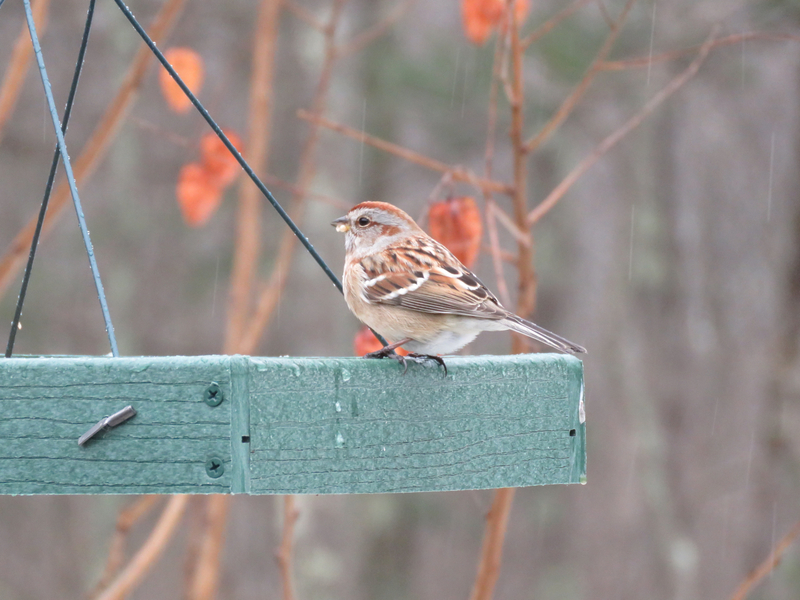 One of our winter sparrows, the American Tree Sparrow, with a few pearly seeds of white proso millet on its beak. I avoid seed mixes with too much millet in them. It is inexpensive and therefore often used as filler. But undoubtedly there are birds that like and even prefer millet, like tree sparrows. I have read that birds, especially in the East, prefer white millet to red. It might be fun to try to grow some white proso millet next summer. Proso is a warm-season grass and is well-adapted to the warm summer temperatures. It is, however, sensitive to frost and therefore usually is planted in June. Proso has a shallow root system, but because of its short growing season, the water requirements for Proso are less than for most other crops. Nice fodder crop or to add organic matter to enrich your soil. Plant to attract birds such as indigo buntings! Proso is well adapted to many soil and climatic conditions; it has a short growing season, and needs little water. The water requirement of proso is probably the lowest of any major cereal. It is an excellent crop for dryland and no-till farming. Proso millet is an annual grass whose plants reach an average height of 100 cm (4 feet). White millet is a favorite with ground-feeding birds including quails, native American sparrows, doves, towhees, juncos, and cardinals. Unfortunately it’s also a favorite with cowbirds and other blackbirds and House Sparrows, which are already subsidized by human activities and supported at unnaturally high population levels by current agricultural practices and habitat changes. When these species are present, it’s wisest to not use millet; virtually all the birds that like it are equally attracted to black oil sunflower. Well, we don’t have house sparrows and I don’t mind the seasonal visits of blackbirds and a couple of cowbirds. Anyway, in winter my gardens are imaginary. This entry was posted in Uncategorized and tagged American Tree Sparrow, bird food, white millet on January 14, 2015 by Amy.